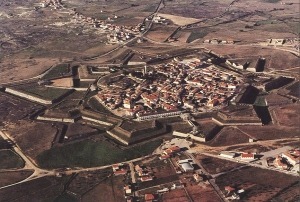 Above: Aerial view of Almeida. Photograph by kind permission of the Câmara Municipal de Almeida. Click to enlarge Above: Portas de São Francisco (inner gate), Almeida. 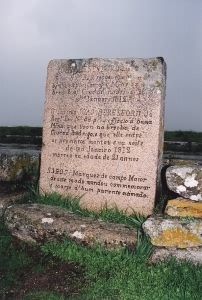 After Ney's 6th Corps had driven Crauford's Light Division across the Côa river on 24th July 1810, Masséna delayed digging siege-trenches in front of Almeida until the arrival of the siege-train and ammunition from Ciudad Rodrigo and Salamanca. Work on the first siege-trench (first parallel) began only on 15th August. Between the 17th and the 24th, 11 batteries comprising more than 50 heavy guns were sited along the first parallel, some 400m distant from the São Pedro Bastion on the south-west corner of the town. At 6am on the 26th, the batteries opened fire. 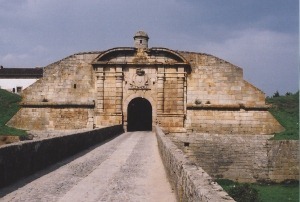 Almeida was a stronger fortress than Ciudad Rodrigo. Defended by more than 100 guns, 40 of which were of 18-pounder or heavier calibre, there was every reason for Wellington to hope that it could hold out until October when the autumn rains would hinder Masséna's further advance into Portugal. The garrison of 4,000 infantry, a squadron of cavalry and 400 gunners, all under the command of William Cox, an English Colonel and Portuguese Brigadier, had ample supplies of food and ammunition. Left: Grave of Lt. John Beresford, 88th Foot, died 28th January 1812 of wounds sustained at the storming of Ciudad Rodrigo nine days earlier. 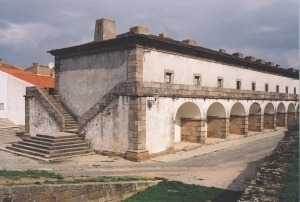 Above: The Barracks at Almeida. Just 13 hours after the bombardment commenced, a freak chain of events forced the almost immediate capitulation of the town. It is said that a French shell burst in the courtyard of the castle, igniting a trail of gunpowder left by a leaking barrel. The burning trail of powder led to the door of the town's magazine in the castle where it caused a second barrel to explode. Within seconds of the shell-burst, the entire magazine detonated taking the castle, the cathedral and the town centre with it. As well as the material destruction, the explosion practically wiped out the town's supply of powder and killed almost all of the 200 artillerymen who were manning the guns on the town's walls. With the town practically defenceless, Cox's only hope was that Wellington would come to his aid in the day or two before surrender became inevitable. In the event, the renewal of the French bombardment in the evening of the 27th forced Cox to surrender 4 hours later, and the garrison marched out of the town on the morning of the 28th. It was as late as 15th September before Masséna had the confidence to move forward from Almeida. Ten days later, the French vanguard came up to the ridge at Buçaco. Enter Almeida by the Portas de São Francisco double gates on the town's south-west corner. The approach to the inner gate can be disconcerting as it gives the appearance of leading into a black hole (there is a dog-leg within the gate). 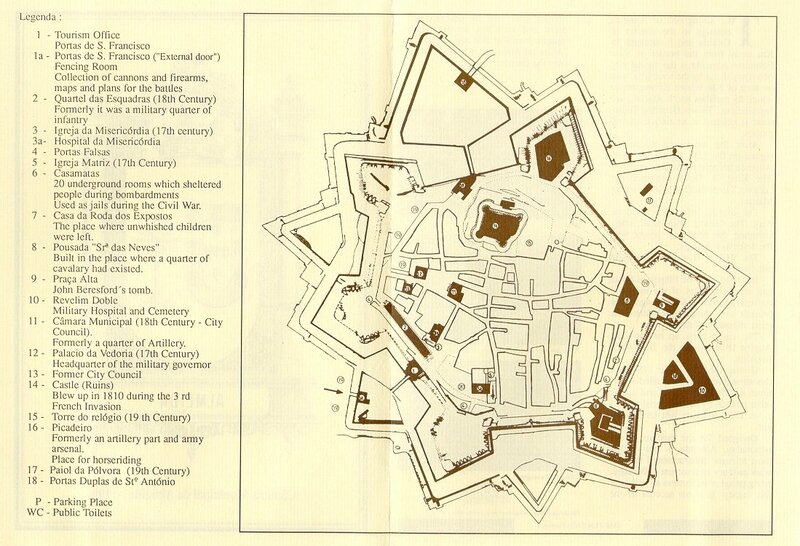 Turn left to find parking alongside the barracks or further along the cobbled road that follows the ramparts. The castle was never rebuilt, and its ruins can be explored from elevated walkways. The town's ramparts are best viewed from outside. The grave of Lt. John Beresford (see photograph above) can be found just to the east of the Pousada. Leave the town by another set of double gates, the Portas Duplas de St° António. Robert Burnham's article on the siege of Almeida. Map of the French siege of Almeida, 15th-28th August 1810 and Street Map of Almeida, both courtesy of The Napoleon Series.